In 2014, Ed Miliband and his colleagues need to understand once more the reasons The Labour Party came into fruition. And they need to articulate a clear, radical alternative to Tory Austerity with a vision of a post neo-liberal Britain that appeals to swing voters, but also many of those ‘don’t knows’ and stay at home voters Labour needs to so desperately reclaim as its own. These are the people who will be sceptical about Labour as an alternative in 2015 and have been given little reason so far to see Labour offering anything systemically different to the current status quo. The main problem is vision. It often seems Labour has no immediate and long term vision for the future of Britain. For all Ed Miliband’s talk of ‘a One Nation Britain’, policy announcements have been limited to the vague and populist. And with the government swiftly moving towards a Singapore style ‘winner takes all’ capitalism, we need something more. The Tories make no apologies or compromises when it comes to ideology – and this is their strength. They always ensure its radically different, calculated, ruthless – but also more efficient and more on message – than Labour can manage. When elected they don’t get cold feet about implementing their agenda. And that’s why the electorate is clear who the Tories stand for, as well as what they believe in. But who does Labour stand for in 2014, and what does Miliband’s party believe in? The trouble is, even in the safest Labour seat in the country – Liverpool Walton, where I live – go out and ask voters what say, an ‘energy price freeze’ means to them. They smile at first, agree it’s a temporary ‘fix’ – but then want to know what happens after that. And what about the energy companies? The same energy companies that will probably just raise prices before and after the price freeze. It’s clear they feel this is a policy based on populism and timidity. It’s clear Ed Miliband could go further, and offer a long-term change in the way energy is shared out and governed. And then Labour would look serious. The party would clearly state its intentions loud and clear. But once again, Labour are completely failing to offer a clear alternative. Caroline Flint and Labour’s energy team are completely wedded to the concept of a market in energy, almost to a level bordering on blind idolatry of the big six’s ability to be ‘reformed’. But in voters’ eyes, public confidence in the big six is at an all time low. The electorate want a dramatic shift away from markets and competition – in short, they want something different. And to achieve this, Labour must move on from tired Blairite ideology. Not only in this area, but across the board. As recently as last November, YouGov polled 68% of the British Public wanting public ownership of energy and rail – so why doesn’t Labour have a clear policy on this? Why is it instead supporting a flimsy, bureaucratic version of ‘tough new regulators’ and ‘tough regulation’ to supposedly protect consumers? The real argument of consumer protection is quite simple. Under public ownership, consumers become participants, and have real control over energy and rail. Whereas currently, they are simply exploited by the big companies for the latter’s own ends. Reformist politics may have been good enough in the boom years, but in the days of public alienation of voting and politics, cuts, and Tory austerity, voters will only accept and vote for a party with the plans, will and clear intentions of offering a seismic shift in economic and social values. Labour must offer a simple but convincing vision of a socialist Britain. And it shouldn’t be anything to be afraid of or apologise for either. It would draw clear red lines before the Tories’ small state and a constant race to the bottom. It would be popular, it would empower citizens to pull the strings of their daily lives and the services they use. Private enterprise would no longer be able to enslave them to debt and endless misery. What’s more, it would be economically credible. As radical left-wing governments in Venezuela, Cuba and across South America have proven, socialism can deliver growth, economic freedom & prosperity across a nation – prosperity that capitalism can only dream of. Ed Balls’s shadow chancellorship has brought a number of issues to the fore. He may be an intellectual heavyweight and Harvard economist, but he is politically, in part – neoliberal. Indeed the amount of economic ground he has conceded to the Tories has been unforgivable, consequently hampering Labour and Ed Miliband’s ability to offer a clear alternative that the trade unions have been arguing for, and the general public are begging for. Indeed one of my own trade union’s – Unite – main policy requests, and a desire of many of my fellow cleaners at work, is a statutory living wage. But Balls does not support this, so therefore for all his platitudes on low pay and his complete lack of talk on collective bargaining rights, his talk is cheap when it comes to any hope and method of tackling low pay. 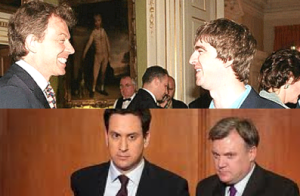 It seems Balls is still stuck in 1997, and the heady days of Blair courting parties with Noel Gallagher at Number 10 and the arguments of New Labour with his insistence that the party adopts Tory spending plans. Much like the New Deal of 1997, young people must take the first job offered to them, plus public sector pay freezes, certain cuts and ‘iron discipline’ with regular departmental spending reviews. In doing so, he’s fallen into that old gradualist, Fabian trap of ‘doing a lot when there is little money around’. Liam Byrne’s infamous parting shot springs to mind. All these plans are much like what New Labour offered in 1997. But now it’s worse: it gives concessions and intellectual ground to the Tories idea of a small state. Labour has hinted it will not reverse Tory cuts, reforms and privatisations in areas like Royal Mail, The Probation and Courts Service and social security (DLA/PIP). There is a de facto acceptance that the provision of public service will be permanently smaller, therefore creating a smaller state. It is little wonder the Tories are miles ahead on the economy when the best Labour can offer is meek acceptance and tame argument of the government’s economic argument, and a tedious ‘five point plan’ for ‘jobs and growth’. If you look weak and don’t stand up for your principles in public, how on earth are you going to look a credible party of government? Then ask yourself this. Every time Ed Miliband gets up and tells the electorate that ‘you think where all the same, but we’re not’ – do you understand why, in light of Balls’s economic policies, many voters feel Labour will be no different to the Tories? Every time Miliband speaks of ‘community organising’ but fails to realise keeping Tory cuts in communities, it is not just contradictory, but a treachery. Yet another example and excuse for people to switch off from politics. Ed Miliband has not only failed to realise and appreciate the collective and economic power of socialism and the trade unions and the effects of cuts on communities alienating people from politics, but also what the public actually mean by ‘you’re all the same’. Voters in my constituency who tell me exactly that on the doorstep mean very simply and specifically in terms of policy, there is very little difference between the three main parties. In their eyes, when you have a party that is so scared to put one foot wrong, it takes near on a year to come out against such a matter of principle and injustice as the Bedroom Tax. That party ceases to be on their side, it appears confused, fickle and unwilling to take decisive action to help those in need. It is to Ed Miliband’s credit that he finally saw sense and came out against the bedroom tax, but he must go further and oppose far more of the vicious Tory policies sweeping their way through Britain. At the moment, our policies seem far too based on ‘focus groups’ and naked opportunism whenever the time suits us. Labour’s opposition to intervention in Syria did not seem principled at all – but political chess cooked up on the sofa in the manner of Blair. Groups on the left, such as the Labour Representation Committee (LRC), have clear ambitions. To campaign fairly and squarely for socialist policies within the Labour movement and party. Our advice for Ed Miliband would be simple: offer people a real hope and alternatives; put clear political distance between our party and the government; realise the popularity of certain socialist platforms. Defend the trade union link, and see the trade unions as your friends, and real active participants once more in our party, instead of just a pool of electoral and financial support. Consider the electorate as your congregation, a river of people swimming towards you, who you can help quite literally turn the tide in the their favour. If only you have the right policy, the right words and the right principles. Then they’ll vote for you, so you can deliver that Labour majority in 2015 – one based on a real desire for an alternative. That responsibility is yours, if you have the courage to deliver it, victory will be your prize. If you don’t, Labour will head the way as PASOK in Greece. The choice is yours. Thomas Butler is youth officer of the LRC and Liverpool Walton CLP. Posted in: CLPD, Ideology, Labour, Politics. Will Labour reject neo-liberal marketising solutions to our problems in 2014? Will it develop a robust left view of the reforms needed and go out and fight for them to win back voters and attract new ones? Will it look like a party that has as clear a philosophy as the Conservatives for which it will standup as energetically? Will it take steps in the direction of social solutions to social problems instead of private solutions? Look at the Shadow Cabinet, read the speeches and the deristory products of the so-called “policy review”. Consider the near total lack of discussion about political and economic fundamentals in the Labour Party. After that the answer surely has to be in every case “not a chance”. It would require an uprising of members within the Party demanding something very different from what the leadership is proposing and there is precious little sign of that. Groups such as Progress have the Party pretty much where they want it and there is no discussion about the socialist solutions favoured by this article. So-called “responsible capitalism” (rather like Ted Heath’s “Capitalism with a human face”) is as far as Labour can go and all the signs are that this will mean very little. What can one say of Labour leaders who want to wrap themselves in the mantle of Disraeli claiming him to be a “working class champion”? On top of all that we have Labour’s Byzantine policy making processes which are simply a cover behind which the leaders make up policy when they feel like doing so. Thomas Butler says “Labour must offer a simple but convincing vision of a socialist Britain.” and I have every sympathy with this but again, let’s be realistic, there is not a snowflake in hell’s chance of this happening in 2014. Just one final point. Where does this talk of being an “intellectual heavyweight” come from. In every discussion where I see this comment I ask for evidence of this. I know of absolutely none. I’ve read his speeches which consist of little else than a vague (non-detailed) Keynesian hand waving. If anyone can point to anything by Balls which gives evidence for him being an original thinker in any way then I would like to see it. An excellent thought provoking piece by Tommy. Temp fixes are ok, up to a point, but Labour should be planning policies for the long term, but there’s still little sign of this happening. Balls is stuck in a rut, and needs to be moved; get someone with more socialist but pragmatic policies in. There is a good case for renationalising the rail system as it should lead to a more rational and efficient system. But to ask also for renationalising of the energy companies is asking too much. It would be too costly. A simpler solution would be for the government to become the sole purchaser of energy from the producing companies, and the sole reseller of energy to consumers. A Labour Government could then develop a pricing policy that the public wants. No standing charges, no deals, no switching and lower charges for lower consumption. There is a problem with this. Miliband only “saw sense” once the opinion polls began shifting to opposition against the tax. Miliband is not as brave or principled a politician as his spin-doctors would have us believe. A similar approach lies behind Miliband’s challenge to Murdoch. Miliband merely gave voice the tide of public opinion that had already begun to run against Murdoch. But wee Dougie Alexander really let the cat out of the bag on Question Time. Having broken with Murdoch wee Dougie was asked how the Labour Party would manage without a friendly media baron onside. In an eyebrow-raising moment of forgetfulness Wee Dougie replied: it didn’t really matter because the rise of social media has considerably reduced dependency on traditional media. Public ownership of key utilities and infrastructure is very popular amongst all voter groups, of all ages. The only reason I can see for Labour to oppose it is the incoming US-EU free trade deal which opens up all public services to open competition. This is the real threat to democratic control of our resources, not the Bullingdon Club. That really does raise concerns about the state giving up sovereignty. I am sure this will become a hot topic.